Well, it took me long enough, but I've finally started to quilt Sieuwke's Quilt. 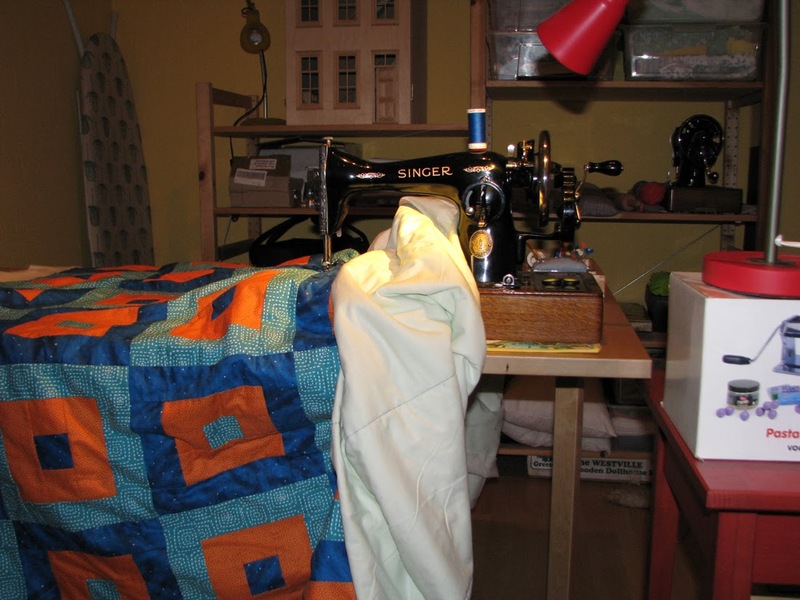 I used a rather unusual way to sandwich the quilt, due to the size. Of course I wasn't looking forward to sandwich a quilt on the floor on my hands and knees to begin with, but also because I'm short. So I would have to crawl over it anyway, and most likely inadvertently cause wrinkling. Instead I first spread the background fabric on my bed, and positioned the wadding (batting) on top of it. I had already marked the center. Then I laid the background fabric along with the wadding on a table with a smooth surface, and checked for wrinkles. Lastly I carefully draped the patchwork over them, again smoothing out the sandwich and started pinning from the center. Although I used a thin wadding the quilt is quite heavy. 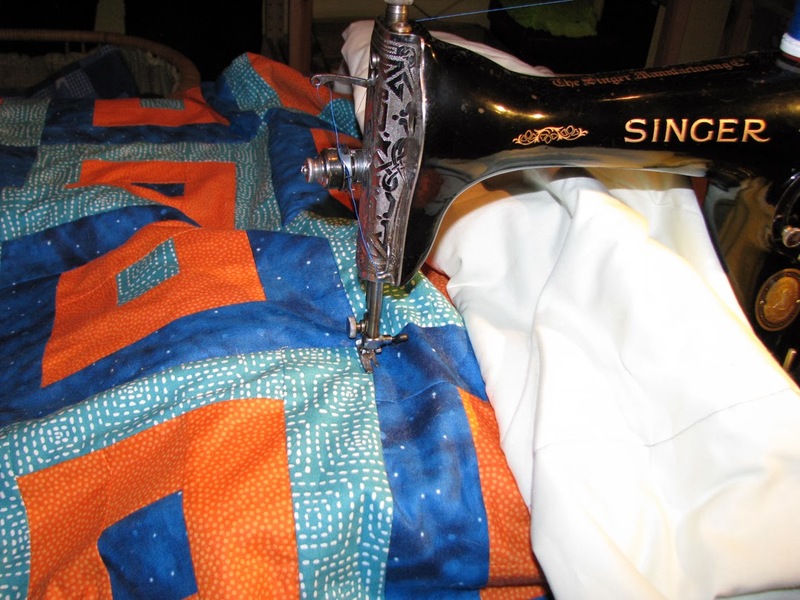 Much to my delight quilting in the ditch is going well, considering that I'm not very experienced at machine quilting. So far I've managed to stay in the ditch most of the time. My arms tire, though, from handling the quilt. So I do two to three rows at the time, and take a rest or work on something else for a while. Well, here you can see why it's hard on my arm muscles. I can stitch almost 3/4", smooth out the fabric, move the large part that is not being stitched along, and keep the folded part flat so it doesn't interfere with my lamp. That's it, folks. I'm off to bed. Nice and warm colors! Beautyfull result. Only three different fabrics , How nice! Hij is inmiddels af en ligt op mijn bed. Een fijne herinnering aan mijn lieve Sieuwke. Wat een prachtige, vrolijke quilt is dit! Dankjewel, Jeanneke, ik had nog nooit gehoord van 'dubbelen met latten'. Wat leuk dat je aanbiedt om te helpen, maar ik woon in Nijmegen. Ik vrees dat ik met een internet lesje zal moeten doen, maar het lijkt me beslist wat! Vooral omdat ik binnenkort aan een nieuwe grote quilt wil gaan beginnen.